It happens to us all, right? A social media idea is suggested, it’s got some legs but is a bit tricky to implement. You want to make this idea work, but there’s some serious thinking to be done on how to execute it effectively and on-brand. 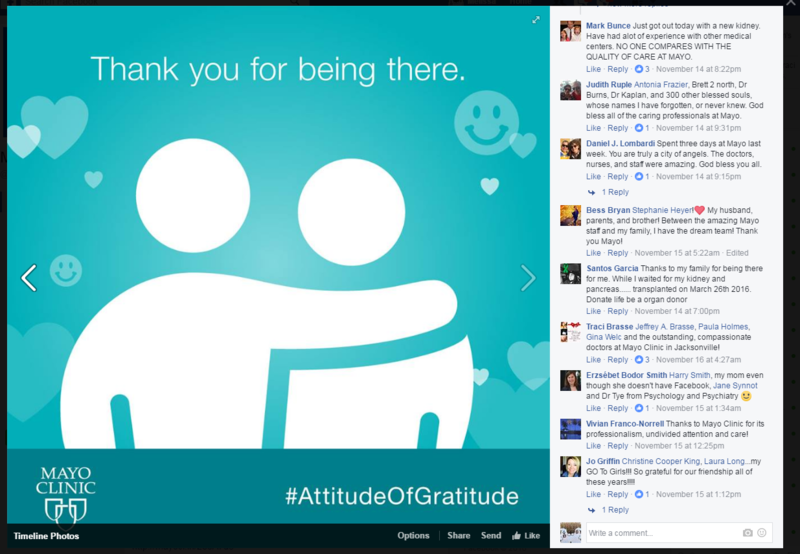 This was the story of our Thanksgiving social media campaign last year, that we called #AttitudeofGratitude. Enter a team of expert partners and folks willing to try something new for Mayo Clinic. Here are the top 5 tips on how to approach a Thanksgiving season campaign. As a team, we spent time talking about Mayo Clinic’s true content strategy for the season. We wanted a focus that would resonate and feel authentic to our brand and what we stand for. We’re a medical provider with health content authority, but we’re also dedicated to keeping the patient at the center of all we do—known for it, in fact. So, we felt making the human, emotional connection beyond just health information was key. We looked beyond social media engagement and our key sharing metric, to consider the next level of engagement. We created base content in our patient-to-patient community, Mayo Clinic Connect, to introduce users to the platform and our pilot Mayo Clinic Champions program. The campaign generated an 89% rise in Connect registrations and contributed to an additional 45 Champion registrations. A critical element in the campaign was community participation. We developed several content pieces with questions to answer, calls to share, and asks for people to tag and thank their caregivers/supporters on Facebook, Twitter, and Instagram. The average engagement per post increased across all channels. One element of the campaign we watched closely was the response to our message of gratitude in our community. 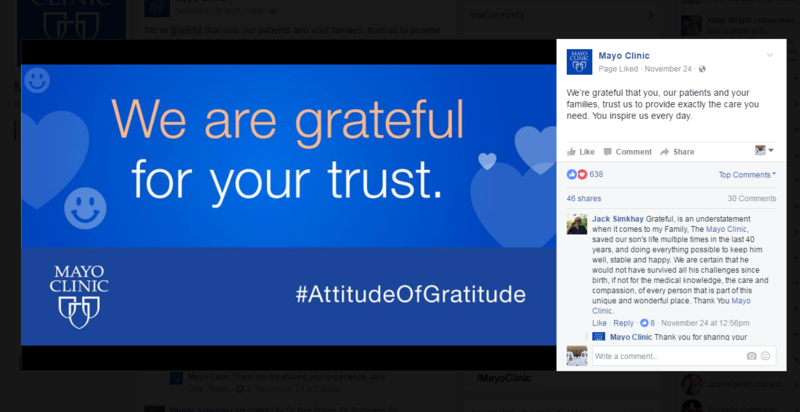 People engaged with the content but also co-opted it as an opportunity to thank Mayo Clinic doctors, nurses, and staff for the care they received. There were some amazing stories and heartfelt responses from our community. Overall, this campaign proved a success with increases in our average per post engagement across all channels, ranging from 22% to 87%, and strong share and click-thru metrics for our content drivers. Our approach to content strategy for this campaign set the stage to move people up the engagement ladder and offered content customization learnings per social channel. Have you implemented a Thanksgiving or seasonal campaign? What did you learn?